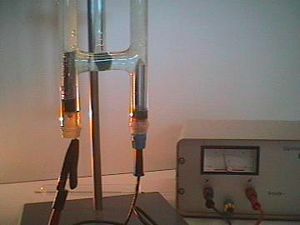 In an apparatus (Hoffman voltameter) set up for the electrolysis of water, the electrolyte consists of a solution of ions in water. An electrolyte (or lyte, in abbreviated jargon) is a material containing free ions that can conduct an electrical current. Most electrolytes consist of ions in solution, and they are referred to as ionic solutions. Some electrolytes consist of molten salts, others are solids (proton conductors), and yet others are gases. All higher life forms require a complex balance of electrolytes inside and outside their cell structures. In humans, this balance is regulated by hormones, and disruption of this balance leads to health problems. In addition, electrolytes are useful in a variety of applications, such as for electrical batteries, fuel cells, and electroplating processes. Electrolytes commonly exist as solutions of acids, bases, or salts. Furthermore, some gases may act as electrolytes under conditions of high temperature or low pressure. Electrolyte solutions can also result from the dissolution of some biological polymers (such as DNA and polypeptides) and synthetic polymers (such as polystyrene sulfonate). They are called polyelectrolytes, which contain electrical charges at multiple locations in each molecule. An electrolyte solution may be described as concentrated if it has a high concentration of ions, or dilute if it has a low concentration of ions. If a high proportion of the solute dissociates to form free ions, the electrolyte is strong; if most of the solute does not dissociate, the electrolyte is weak. The properties of electrolytes may be exploited using electrolysis to extract constituent elements and compounds contained within the solution. In physiology, the primary ions of electrolytes are sodium (Na+), potassium (K+), calcium (Ca2+), magnesium (Mg2+), chloride (Cl-), phosphate (PO43-), and hydrogen carbonate (HCO3-). The electric charge symbols of plus (+) and minus (-) indicate that the substance in question is ionic in nature and has an imbalanced distribution of electrons. This is the result of chemical dissociation. All higher life forms require a subtle and complex electrolyte balance between the intracellular and extracellular milieu. In particular, the maintenance of precise osmotic gradients of electrolytes is important. Such gradients affect and regulate the hydration of the body and blood pH, and they are critical for nerve and muscle function. Both muscle tissue and neurons are considered electric tissues of the body. Muscles and neurons are activated by electrolyte activity between the extracellular fluid or interstitial fluid, and intracellular fluid. Electrolytes may enter or leave the cell membrane through specialized protein structures embedded in the plasma membrane called ion channels. For example, muscle contraction is dependent upon the presence of calcium (Ca2+), sodium (Na+), and potassium (K+). Without sufficient levels of these key electrolytes, muscle weakness or severe muscle contractions may occur. Electrolyte balance is maintained by oral, or (in emergencies) intravenous (IV) intake of electrolyte-containing substances, and it is regulated by hormones, generally with the kidneys flushing out excess levels. In humans, electrolyte homeostasis is regulated by hormones such as antidiuretic hormone, aldosterone and parathyroid hormone. Serious electrolyte disturbances, such as dehydration and overhydration, may lead to cardiac and neurological complications and, unless they are rapidly resolved, will result in a medical emergency. The measurement of electrolytes is a common diagnostic procedure, performed via blood testing with ion selective electrodes or urinalysis by medical technologists. The interpretation of these values is somewhat meaningless without analysis of the person's clinical history and is often impossible without parallel measurement of renal function. Electrolytes measured most often are sodium and potassium. Chloride levels are rarely measured except for arterial blood gas interpretation, since they are inherently linked to sodium levels. One important test conducted on urine is the specific gravity test to determine whether there is electrolyte imbalance. Electrolytes are commonly found in sports drinks. In oral rehydration therapy, electrolyte drinks containing sodium and potassium salts replenish the body's water and electrolyte levels after dehydration caused by exercise, diaphoresis, diarrhea, vomiting, or starvation. Giving pure water to a person in such a condition is not the best way to restore fluid levels because it dilutes the salts inside the body's cells and interferes with their chemical functions. This can lead to water intoxication. Sports drinks such as Gatorade, Powerade, or Lucozade are electrolyte drinks with large amounts of added carbohydrates, such as glucose, to provide energy. The drinks commonly sold to the public are isotonic (with osmolality close to that of blood), with hypotonic (with a lower osmolality) and hypertonic (with a higher osmolality) varieties available to athletes, depending on their nutritional needs. It is unnecessary to replace losses of sodium, potassium, and other electrolytes during exercise because it is unlikely that a significant depletion the body's stores of these minerals will occur during normal training. However, under conditions of extreme exercise for over five or six hours (an Ironman or ultramarathon, for example), the consumption of a complex sports drink with electrolytes is recommended. Athletes who do not consume electrolytes under these conditions risk overhydration (or hyponatremia). Because sports drinks typically contain very high levels of sugar, they are not recommended for regular use by children. Rather, specially formulated pediatric electrolyte solutions are recommended. Sports drinks are also not appropriate for replacing the fluid lost during diarrhea. The role of sports drinks is to inhibit electrolyte loss, but they are insufficient to restore balance once it occurs. Medicinal rehydration sachets and drinks are available to replace the key electrolyte ions lost. Dentists recommend that regular consumers of sports drinks observe precautions against tooth decay. Electrolyte and sports drinks can be made at home by using the correct proportions of sugar, salt and water. When two electrodes are placed in an electrolyte and a voltage is applied, one electrode, called the cathode, becomes negatively charged; the other, called the anode, becomes positively charged. Each electrode attracts ions of opposite charge. Positively charged ions (cations) move toward the cathode, while negatively charged ions (anions) move toward the anode. The ions are carriers of electric current through the electrolyte. The cathode supplies electrons to the cations, and the anode takes up electrons from the anions. As a result, the cations and anions are neutralized at the electrodes, producing elements or compounds. In a solution of ions (from a salt) in water, neutral water (H2O) molecules pick up electrons from the cathode and break up into hydroxide (OH−) ions and hydrogen gas (H2). Also, water molecules lose electrons at the anode and break up into oxygen gas (O2) and hydrogen ions (H+). The ions in the electrolyte move to neutralize these charges so that the reactions can continue and the electrons can keep flowing. and oxygen gas is liberated. At the same time, positively charged sodium ions (Na+) move toward the cathode, neutralizing the negative charge of OH− there; and the negatively charged chloride ions (Cl−) move toward the anode, neutralizing the positive charge of H+ there. Without the ions from the electrolyte, the charges around the electrode would slow down continued electron flow; diffusion of H+ and OH− through water to the other electrode takes longer than movement of the much more prevalent salt ions. Electrolytic conductors are used in electronic and other devices where the chemical reaction at a metal/electrolyte interface yields useful effects. In an electrical battery, two metals with different electron affinities are used as electrodes. Electrons flow from one electrode to the other outside of the battery, while inside the battery the circuit is closed by the electrolyte's ions. Here the electrode reactions slowly use up the chemical energy stored in the electrolyte. In some hygrometers, the humidity of air is sensed by measuring the conductivity of a nearly dry electrolyte. Hot, softened glass is an electrolytic conductor, and some glass manufacturers keep the glass molten by passing a large electric current through it. ↑ Elizabeth Quinn, Proper Hydration for Exercise - Water or Sports Drinks About.com. Retrieved June 23, 2008. ↑ Jan Nissl, May 26, 2006, Rehydration drinks WebMD. Retrieved June 23, 2008. Preston, Richard A. 1997. Acid-Base, Fluids, and Electrolytes Made Ridiculously Simple. MedMaster Series. Miami: MedMaster, Inc. ISBN 0940780313. Minerals and Electrolytes The Merck Manuals Online Medical Library. This page was last modified on 18 September 2017, at 21:37.